As the trial of video blogging youth activists Adnan Hajizade and Emin Milli continues in Baku, two English-language bloggers from Azerbaijan react to yesterday's aborted court hearing. Both seem pessimistic and unhappy with how the trial has been conducted to date, but nonetheless say they will continue to fight for the two men's release. In particular, L4L shares his observations from yesterday's hearing, and specifically on the decision not to enter phone records in Hajizade and Milli's defense into court. During today’s hearing of “Wild-beating-taekwando-champions-bloggers-Adnan-and-Emin” case I was able to enter courtroom for the first time. Mixed feelings of what was happening. I saw Emin and Adnan, saw how strong they are. And this made me happy and proud. I had dozen or so rounds of laugh in the expense of “victims” Vusal and Babek. I was annoyed as hell. Then Vusal showed that he is “real Caucasian man” with valor and strong feeling of “qeyret”. He asked judge not to give Azercell’s report on his calls to defense. “I don’t want them to disturb my relatives and those close to me”. […] naturally, judge is “real Caucasian man” too, so he understood Vusal’s tender feelings and was with him on that. […] People like Emin and Adnan who made their choice and are proudly standing by it. Who will not back off. We should help their case. Only this way this nation will shake its AMNESIA. Meanwhile, Flying Carpets and Broken Pipelines remembers events to date, but also looks to the future. Incidentally, the date set for the next hearing (11 November) will coincide with a roundtable discussion on the case at the Central European University in Budapest, Hungary. 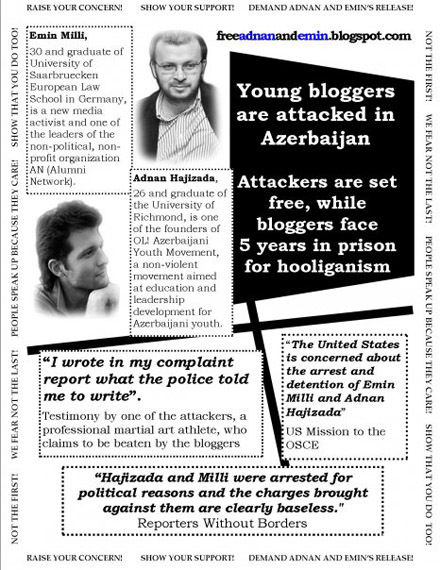 On July 8, 2009, two bloggers and political activists, Andnan Hajizade and Emin Milli, were arrested in Azerbaijan on charges of “hooliganism”. The bloggers were detained shortly after posting a video on YouTube mocking the Azeri government's purchase of donkeys from Germany. After nine trials, the two bloggers (both without prior criminal records) remain imprisoned. The four presenters will form a panel discussion to speak about this particular case of the bloggers and what it means for freedom of speech in Azerbaijan as well as the greater Caucasus region. Present for the event will be Parvana Persiani, Hajizade's girlfriend and a senior figure in the OL! Azerbaijani youth movement, who will also be attending next week's World Blogging Forum in Bucharest, Romania. Global Voices Online will interview her there and Persiani will also feature in a live online interview on Kosmoshow. 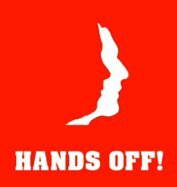 Full coverage of the detention and trial of Adnan Hajizade and Emin Milli is available in the Azerbaijan section of Global Voices Online and on the OL! Blog (in English and Azeri). The hashtag #EminAdnan is also used on Twitter.